Just nine months after our first visit to Elland Road, two brand-new flagship stores designed for Leeds United Football Club have opened for business. 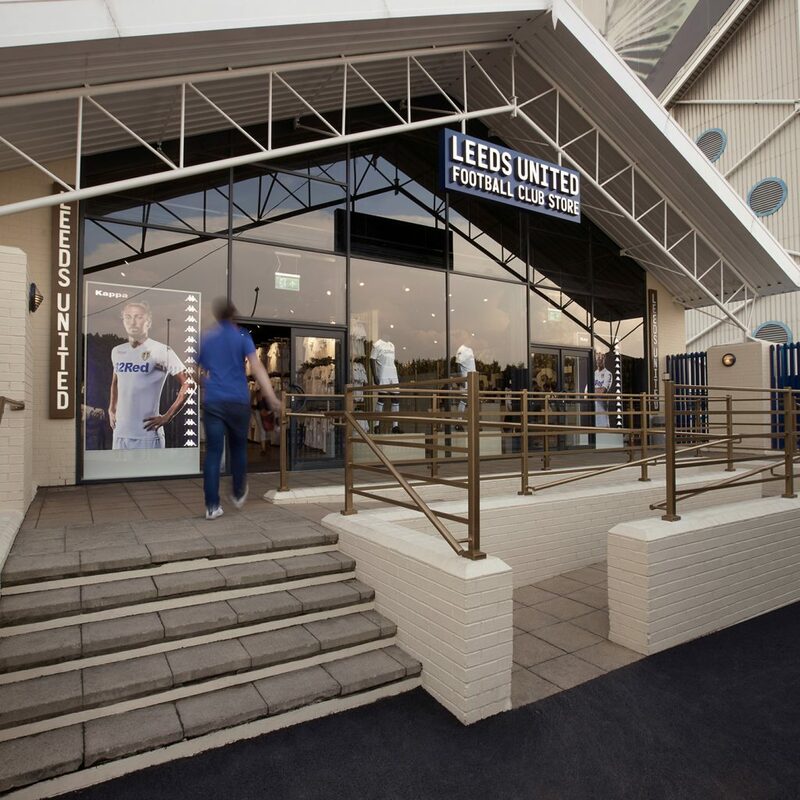 Sited at the Elland Road ground and in the Leeds Trinity Shopping Centre, these stores mark a giant leap from a standard store to a retail destination for the 35,000-plus fans attending home games, and the hundreds of thousands more worldwide. With its storied history and iconic status in the North of England,the challenge was to create a space that brings the emotion and cultural connection the region has with the club back into the store.Making it feel less like a normal shop and more like the experience of going to a game – a space fans can be proud of. The brief featured practical considerations such as increasing the holding capacity by a third, addressing the flow of the store, reducing waiting time, increasing items by basket and upping overall turnover by 20%. Ultimately, though, we needed to create an experience that feels unmistakably Leeds United. We started at the ground, finding the kind of details familiar to the Elland Road faithful – the triangles repeated everywhere and the brutalist concrete zigzags on the Revvy North Stand –and brought those details into the store environment. Our colour palette – putty, imperial blue and antique gold – was a nod to the history of the city of Leeds, in particular the Corn Exchange – but chosen to chime with the club colours and the stadium. Inside the store, new navigation leads customers all around with plenty of space, even on match days – allowing them to easily browse and shop the whole range, with no bottlenecking and a real sense of flow. Bold graphic walls, a new corridor of tills and clean, spaciousconcrete merchandising has radically changed the experience. Outside, we added a blue fence bringing the store in line with the rest of the stadium, and we repainted the entire exterior in the putty colour used elsewhere around Elland Road. We re-glazed the windows, flooding the store with natural light, replaced the railings and redesigned the signage – giving the store a consistent branded look from every angle.